Sun-generated electricity reached a level that actually shifted peak energy demand away from the usual midmorning, showing solar's growing role on the region's electric grid. On last month’s historically cold Thanksgiving Day, New England turkeys were being roasted by the sun. 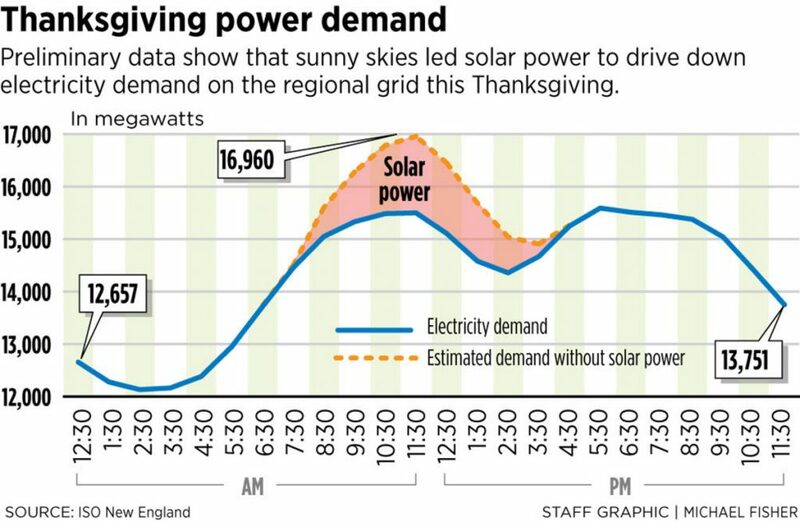 For the first time, according to the region’s electric grid operator, thousands of solar panels offset the midmorning peak demand for power from millions of homes and businesses cooking the holiday birds. The renewable energy milestone was noted this week by ISO-New England. It highlights the growing role of solar energy on the grid and counters lingering myths about the technology not working in cold climates. The day before Thanksgiving, ISO-New England typically issues a news release about the uniqueness of the holiday’s impact on its operations. On any other late-fall day, electricity demand peaks in the early evening as people come home hungry to dark houses. But on Thanksgiving, the ritual of gathering for a big midday meal and watching television has ovens and TVs from Madawaska to Milford, Connecticut, ramping up at dawn. That causes a spike in power demand by 11 a.m. or so. Grid operators have to make sure that enough of the region’s 350 generators are online at that time. And because exceptionally cold weather was in the forecast this year, they were calling for more capacity than usual. The holiday came and went without incident, but this week, the grid operator released a surprising footnote. For the first time since the agency started compiling data in 2000 – and possibly the first time ever – peak demand didn’t come in the midmorning. “The change wasn’t caused by New Englanders suddenly deciding to change their cooking habits, but rather the further influence of solar power in the region,” ISO-New England concluded. Thanksgiving was a notable weather day. Snow covered much of Maine. Record cold temperatures were recorded. It was 5 degrees in Bangor and 6 degrees in Portland. Despite the wintry feel, the day was clear and sunny. That allowed power from the region’s 150,000 or more solar installations to displace demand normally satisfied by large-scale generators, chiefly nuclear and natural-gas plants. Taken together, the region’s solar panels have the capacity to generate 2,700 megawatts under ideal conditions, enough to power 2.7 million homes. The grid operator expects capacity to reach 6,000 megawatts in eight years, spurred by falling costs and government clean-energy policies. This forecast had led to an evolving and complex daily exercise for ISO-New England. The vast majority of today’s solar panels are on home roofs or businesses, where the power is distributed locally. Grid operators in their control room in Holyoke, Massachusetts, can’t “see” or dispatch these installations. But using detailed weather forecasts and other tools, they can calculate solar’s presence as a reduction in demand on the grid. On Thanksgiving, they estimated that solar was contributing 1,500 megawatts to the 15,500 megawatts of capacity needed for the midmorning peak. Thanksgiving wasn’t the only solar highlight for New England in 2018. On April 21, for the first time, the combination of sunshine and mild weather led to demand in the middle of the day dropping below overnight demand. Normally, less power is needed after midnight than any time during the day. During last July’s heat wave, solar installations reduced wholesale power costs in the region by nearly $20 million, according to a study by Synapse Energy Economics. Solar panels have their greatest potential in New England during the summer. That’s because periods of peak demand – when it’s hottest and air conditioners are running – coincide with when the sun is shining. During winter’s short days, peak demand occurs after sunset. But panels actually can be more efficient in the winter, said Fortunat Mueller, co-founder of Maine’s largest solar installer, ReVison Energy, because heat degrades performance. Solar output also falls, of course, when clouds cover the sky. When that happens, ISO-New England has to make sure that fast-start power plants, typically fired by natural gas, are standing by. But that need may diminish. To smooth the ups and downs in output and make solar more useful year round, solar companies and some utilities are pairing panels with state-of-the-art batteries. In Vermont, Green Mountain Power invested $8 million in a pilot program to help customers install 2,000 Tesla Powerwall storage systems. During last summer’s heat wave, the utility lowered demand during peak hours and saved $500,000 with what it calls a virtual power plant. ReVision Energy is planning to participate with Efficiency Maine in two smaller pilot programs next year for homes and businesses. They will include storage and other technologies to integrate solar and reduce demand at peak hours, cutting the need for fossil fuel backup. Not everyone is convinced of the value of solar in New England. Jim LaBrecque, Gov. Paul LePage’s former technical adviser on energy matters, said the benefits of a few hours of solar power on sunny days is offset by forcing gas-fired plants to cut their capacity, which not only reduces revenue but makes them operate less efficiently and use more fuel. “Intermittent and unreliable sources of electricity like solar and wind cannot displace dispatchable generation resources,” said LaBrecque, who was a frequent solar critic for the LePage administration. But as states such as Massachusetts increase their share of renewable energy in response to climate change, Kakley said, ISO-New England is preparing for a generation mix that features more solar and wind. With the projected 6,000 megawatts installed by 2027, Kakley said, solar will have the effect of pushing the hours of peak demand later into a summer day, until around sunset. While conventional power plants still will be needed after that, large-scale storage systems are expected to begin picking up the slack. In September, ENGIE North America and Holyoke Gas & Electric unveiled Massachusetts’ largest utility-scale energy storage system, at the Mt. Tom Solar Farm in Holyoke. The 3-megawatt battery unit is integrated into the state’s largest community solar farm. It’s on the grounds of a former coal- and oil-fired power plant.